Hidden among dense foliage and dotting the powder-white beaches of the private Kunfunadhoo Island in the Baa Atoll UNESCO Biosphere Reserve, Soneva Fushi is a luxury boutique hotel that offers a magical retreat from the world. Inspiring the imagination with romance, the hotel boasts a collection of spacious eco-chic beachfront villas, an exclusive spa and wellness center, award-winning restaurants and bars, spectacular swimming pools and an array of activities and amenities. 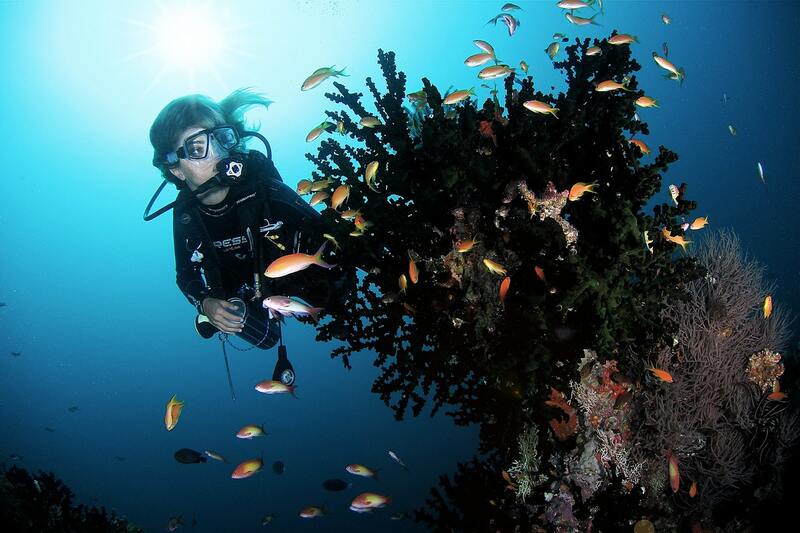 The island is surrounded by a mesmerizing house reef that is home to colorful reefs and a myriad of vibrant fish and other marine creatures that provide out-of-this-world snorkeling and scuba diving opportunities. Other exclusive services at this laid-back playground of desert-island indulgence include personalized butler services, group yoga, and tai chi classes, an open-air cinema, and an observatory for star-gazing. 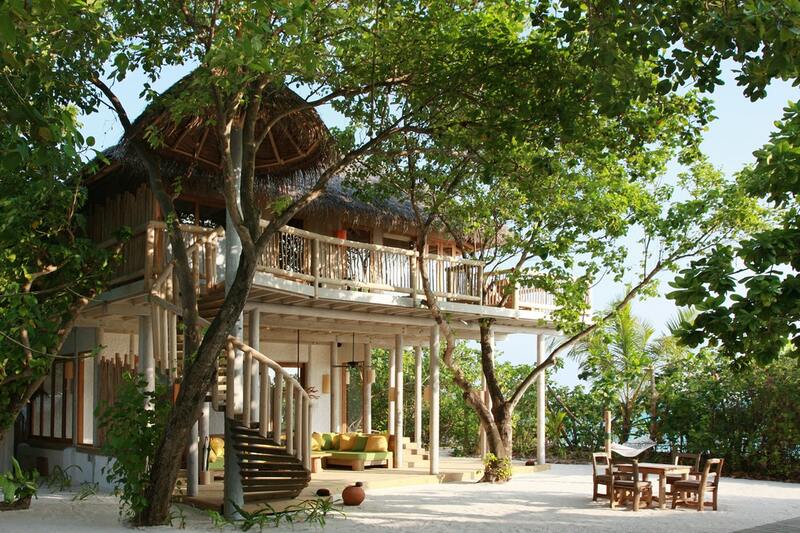 Soneva Fushi features 57 luxuriously appointed villas with uninterrupted views of the ocean. Villas are located on the sunset or sunrise side of the island with direct access to secluded stretches of beach, private seawater swimming pools, and lush gardens with outdoor bathrooms with showers. Spacious, rustic-chic interiors have designer décor, wooden finishes, en-suite bathrooms with soaking tubs and walk-in showers, and deluxe amenities such as air-conditioning, flat-screen televisions, DVD player, pre-loaded iPod and dock, stash of CDs and DVDs, tea and coffee-making facilities, minibars, binoculars, complimentary wireless Internet, and personalized butler services. One-Bedroom Crusoe Villa Suites and Crusoe Villa Suites with Pools are well-appointed double-story villas spanning 6,943 square feet upstairs observation decks, king bedrooms with en-suite bathrooms, open-air bathrooms with soaking tubs and separate showers, fully-equipped kitchens, and airy living rooms with luxe daybeds. Expansive wooden terraces have outdoor dining tables, daybeds and sitting areas with sun loungers, and private swimming pools and modern amenities include minibars with wine coolers, Bose Hi-fi systems with docking stations, DVD players, air-conditioning and ceiling fans, high-speed wireless Internet and personalized butler services. Soneva Fushi Family Villa Suites are the largest of the one-bedroom villa suites and feature the same amenities and facilities as the Crusoe Villa Suites and Crusoe Villa Suites with Pools, as well as separate children’s rooms with bathrooms, and upper observation decks. 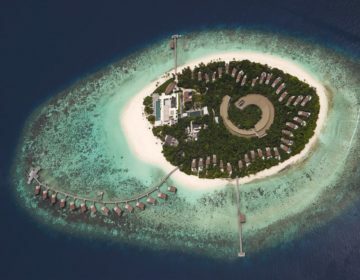 To book the One-Bedroom Crusoe Villa Suites and Crusoe Villa Suites with Pools, or the Soneva Fushi Family Villa Suites, click here. Two-Bedroom Crusoe Villa Suites and Soneva Fushi Villa Suites are 4,252 square feet in size and feature two spacious bedrooms with king size beds with en suite bathrooms, dressing rooms and daybeds, open-air garden bathrooms with large bathtubs, and separate showers, and private swimming pools. Deluxe amenities include air-conditioning, flat-screen televisions, DVD player, pre-loaded iPod and dock, a stash of CDs and DVDs, tea and coffee-making facilities, minibars, binoculars, complimentary wireless Internet, and personalized butler services. Two-Bedroom Crusoe Villa Suites with Pools are 6,986 square feet in size and enjoy all the same amenities and facilities as the Crusoe Villas Suites and Soneva Fushi Villa Suites, including private wine cellars, fully-equipped gyms, and steam rooms. 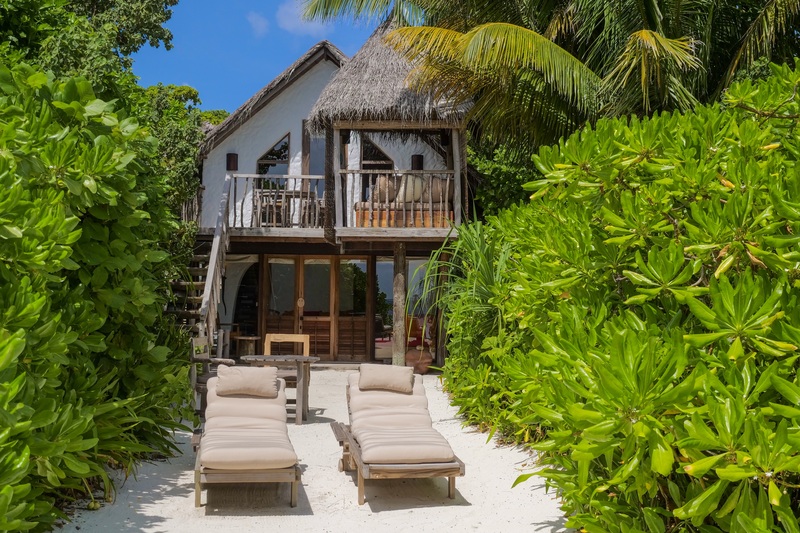 To book Two-Bedroom Crusoe Villa Suites and Soneva Fushi Villa Suites, click here. Three-Bedroom Soneva Fushi Villa Suites with Pools are expansive beachfront suites with separate two-story and one-story villas featuring three spacious bedrooms with king size beds, expansive indoor and outdoor living areas, large balconies on the top floors with ocean views, and private swimming pools complete with sunken dining tables and seating. Luxurious master open-air garden bathrooms have water features, steam facilities, large bathtubs, and indoor and outdoor showers, and second open-air guest bathrooms have tubs and outdoor showers. Private outside sitting areas have sun loungers and direct access to the beach, and modern amenities include wine fridges, air-conditioning, flat-screen televisions, DVD player, pre-loaded iPod and dock, a stash of CDs and DVDs, tea and coffee-making facilities, minibars, binoculars, complimentary wireless Internet, and personalized butler services. 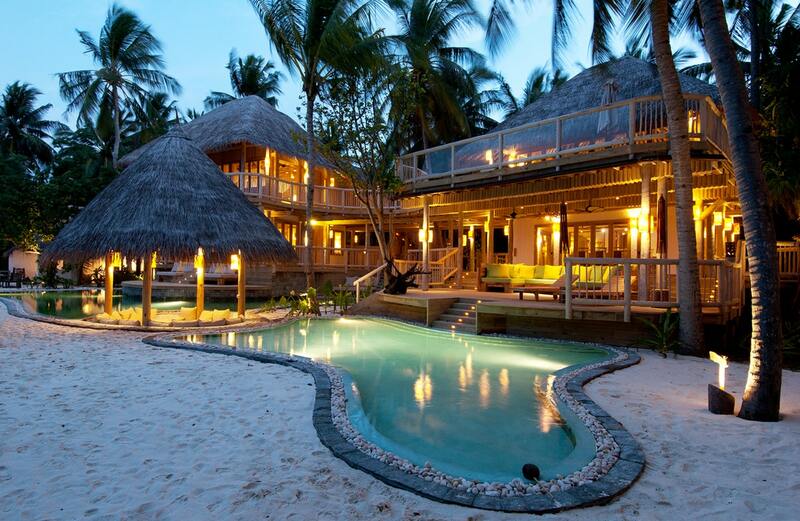 To book the Three-Bedroom Soneva Fushi Villa Suites with Pools, click here. The three-bedroom Sunrise Retreat is 14,693 square feet in size and features three double-story, one-bedrooms with king size beds, luxurious open-air garden bathrooms with bathtubs and showers, a dining pavilion overlooking a large private swimming pool, and a private outside sitting area with sun loungers and direct access to the beach. Bungalows are connected by suspended walkways and share a gourmet kitchen, an open study area, a fully equipped gym, outdoor relaxation areas, and extensive balconies with beautiful ocean views. Modern amenities such as wine fridges, air-conditioning, flat-screen televisions, DVD player, pre-loaded iPod and dock, a stash of CDs and DVDs, tea and coffee-making facilities, minibars, binoculars, complimentary wireless Internet, and personalized butler services. To book the Sunrise Retreat, click here. 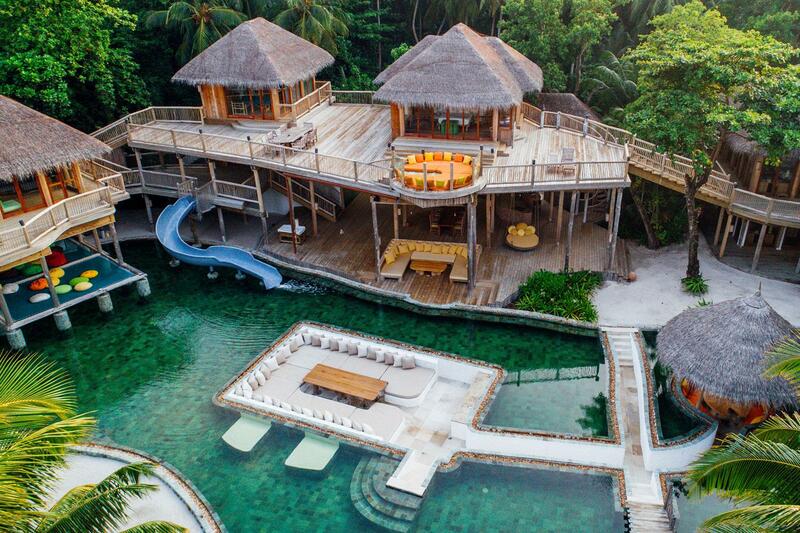 The Four-Bedroom Soneva Fushi Villa Suite with Pool is 6,534 square feet in size and an expensive master bedroom with an en-suite indoor and outdoor bathroom complete with a waterfall feature and dressing room, living area and additional daybeds. Three additional bedrooms have large guest open-air bathrooms with separate showers, and the villa boasts expansive indoor and outdoor living areas, a secluded outside sitting area, a private swimming pool with seating area, a library, a gourmet kitchen, and a fully fitted pantry. Modern amenities such as wine fridges, air-conditioning, flat-screen televisions, DVD player, pre-loaded iPod and dock, a stash of CDs and DVDs, tea and coffee-making facilities, minibars, binoculars, complimentary wireless Internet, and personalized butler services. 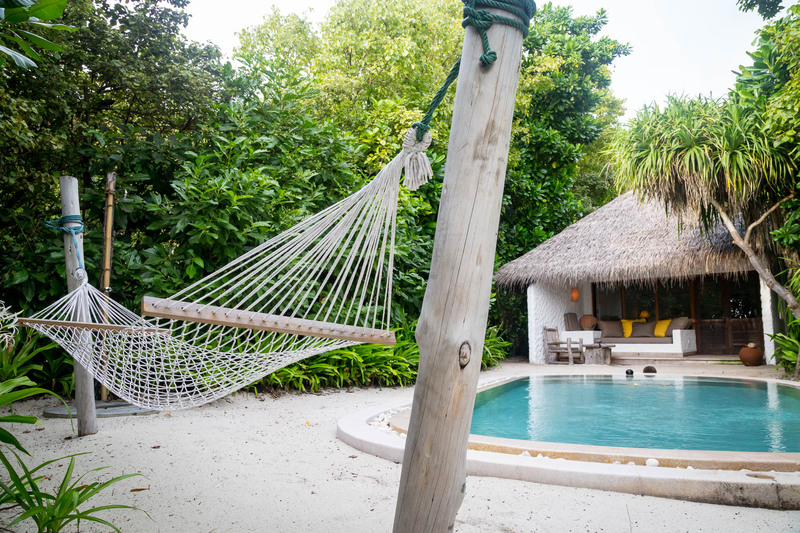 To book the Four-Bedroom Soneva Fushi Villa Suite with Pool, click here. The spacious Jungle Reserve spans 17,115 square feet and features four spacious bedrooms with king size beds, including a master bedroom suite with outdoor and an indoor bathroom, dressing room, and its private sala, and three guest bedroom suites with outdoor and indoor bathrooms, dressing rooms and additional daybeds. The villa also boasts three luxurious open-air private garden bathrooms with large bathtubs and separate showers, a dining room with ten chairs, a large sitting room with two daybeds, a fully fitted gourmet kitchen and a private outside sitting area with sun loungers and direct access to the beach. Other deluxe facilities include a spa suite with a couple’s treatment room, massage beds and a bathroom with blitz shower, private sauna and separate steam room, a fully equipped gym with equipment, a private swimming pool and smaller children’s pool, a private office with a library, and a sunken outdoor dining table that seats 10 people. To book the Jungle Reserve, click here. Villa 37 is a five-bedroom, 19,623 square foot villa with an 11-meter high viewing tower and moonlight table for dining beneath the stars, two outdoor swimming pools and a water slide, a sauna and a steam room, an open plan kitchen, living and dining rooms, two sunken outdoor areas – covered and uncovered, expensive outdoor decks with hammocks, sun loungers and day beds, snooker and foosball tables and modern amenities such as wine fridges, air-conditioning, flat-screen televisions, DVD player, pre-loaded iPod and dock, stash of CDs and DVDs, tea and coffee-making facilities, minibars, binoculars, complimentary wireless Internet, and personalized butler services. To book Villa 37, click here. Boasting 59,632 square feet of space and nine bedrooms for up to 18 adults and three children, the Private Reserve is a study in opulence and unrivaled island living. 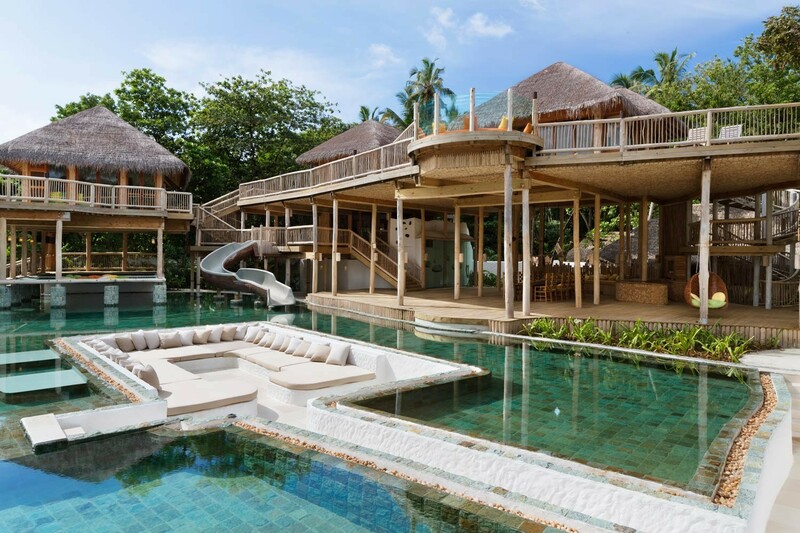 Escape to a world of jungle fantasies in this deserted-island mansion on an oceanic scale with palm frond roofs, woven ropes, and tree branch banisters. The master bedroom has a detached master bathroom and dressing room and an open upper floor sundeck with a private pool, six guest bedrooms have en-suite bathrooms and other rooms include a children’s room and a nanny’s room. The villa features a spa suite with steam bath, sauna, spa treatment room and outdoor shower, a fully-equipped gym, a guest lounge, TV lounge, and living room, and a private study room, and large swimming pool with a water slide, a sunken daybed, a circular cover roof and sunken sala accessible by a bridge. Other features include a spacious gourmet kitchen with packed pantry, an open-air garden bathroom and outside sitting area with sun loungers and direct access to the beach. Modern amenities such as wine fridges, air-conditioning, flat-screen televisions, DVD player, pre-loaded iPod and dock, a stash of CDs and DVDs, tea and coffee-making facilities, minibars, binoculars, complimentary wireless Internet, and personalized butler services. To book the Private Reserve, click here. 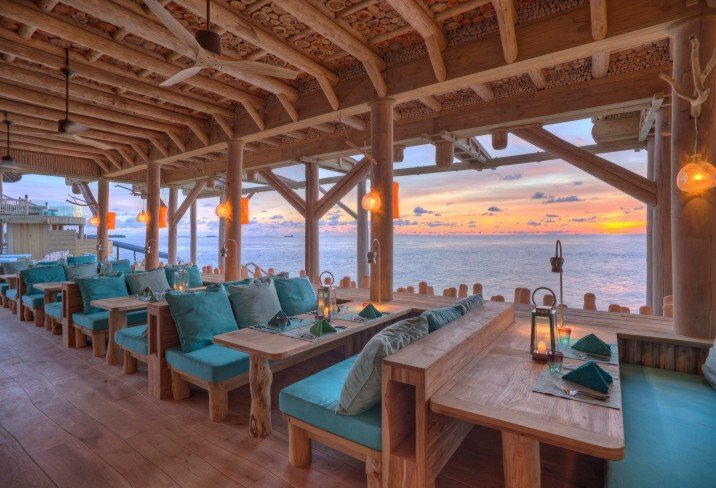 Soneva Fushi offers a range of diverse and memorable dining experiences from themed evenings showcasing a variety of cultures and cuisines to elaborate romantic escapades and simple beach barbecues. Serving award-winning cuisine prepared with sustainably-sourced ingredients and presented with flair by inventive chefs from around the world, several restaurants promise to sate every palate. Aptly named, Fresh in the Garden is a treetop wonderland where guests can enjoy Mediterranean, organic, vegetarian and plant-based cuisine in a spectacular setting. 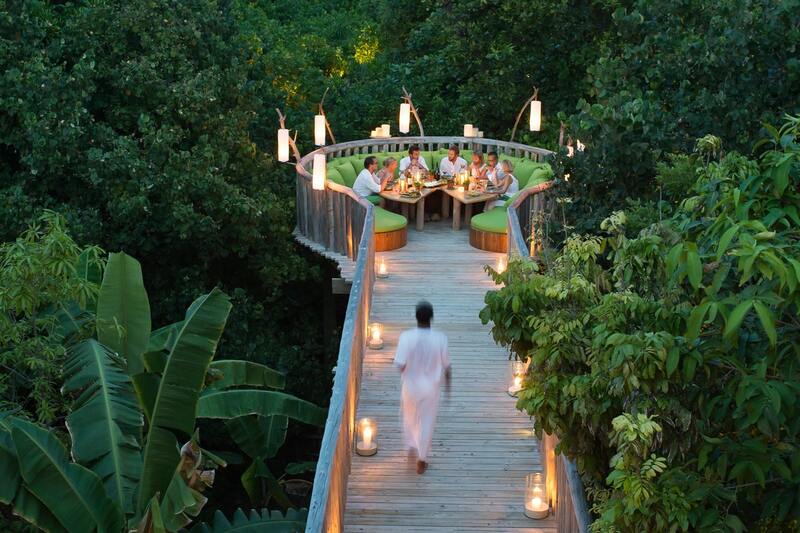 Serving dinner high above the ground among the tree tops surrounded by the fresh aromas of herbs, the restaurant has an open kitchen where chefs showcase their expertise and open-air dining tables where guests can dine beneath the stars. 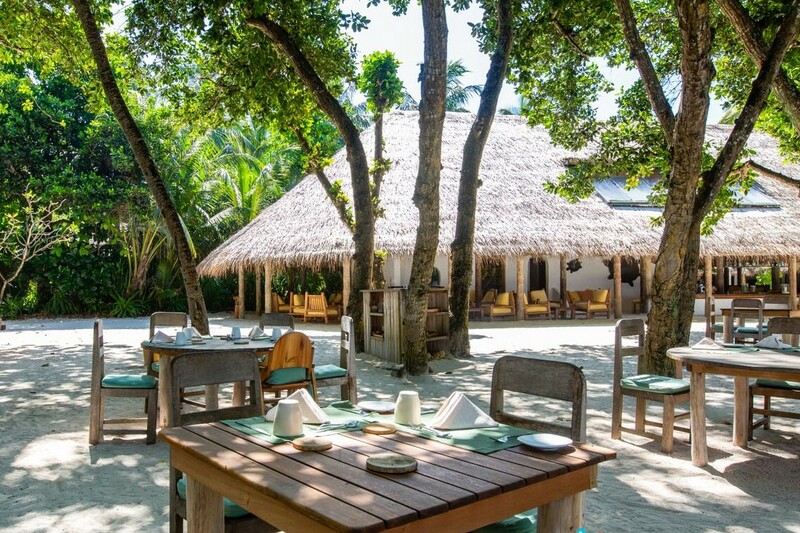 Open for breakfast, lunch, and dinner, Mihiree Mithaa offers a bountiful buffet, offering freshly cut fruits, baked goodies, a salad room, wood-fired pizzas, along with decadent desserts from Soneva’s ubiquitous ice cream and chocolate rooms. 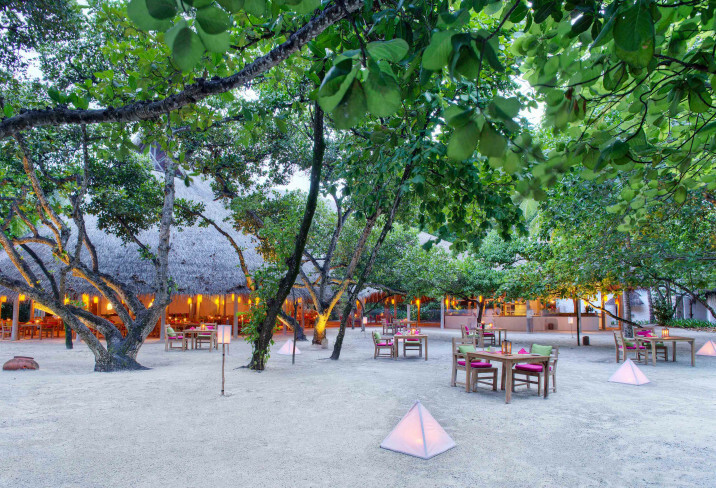 Sobah’s Restaurant is a traditional Maldivian restaurant that serves dinner twice a week on the secluded sands of an uninhabited island, a 15-minute speedboat ride away from Soneva Fushi. The award-winning Chef Sobah uses traditional cooking methods to prepare dishes with ingredients he forages for and catches around the island. Out of the Blue is an award-winning restaurant that serves a variety of Asian cuisine with a focus on Vietnamese and Indonesian flavors for lunch and dinner. Set within a two-story over-water structure that houses five other unique dining experiences, Out of the Blue features a robata grill, josper grill, and pizza area, and the menu offer fresh salads, grilled meats, and ocean-fresh seafood. Once Upon a Table is a culinary theater based at Soneva Fushi’s Out of the Blue that showcases some of the biggest names in fine dining. 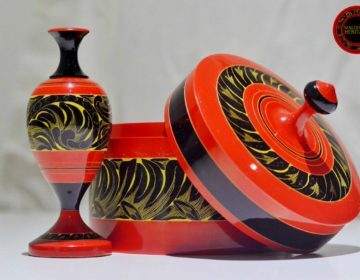 There is no menu, allowing the creativity and skills of the chef to take center stage. Once Upon a Table features a private horseshoe-shaped table that seats only eight guests, allowing guests to watch the chefs at work creating and serving their dishes, and to also interact with the chefs themselves. 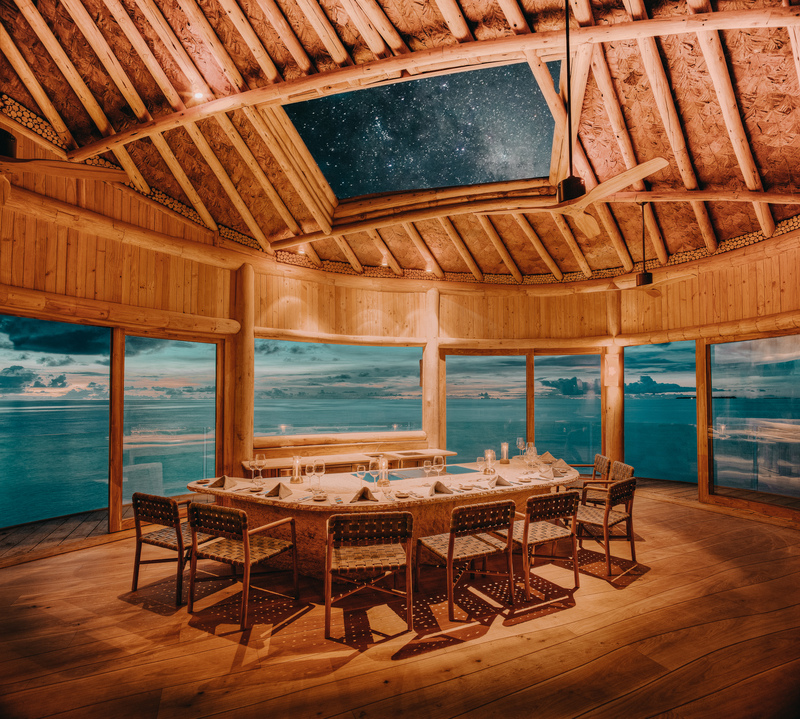 Offering an evening of inspired cooking and culinary creations, Once Upon a Table is completed floor-to-ceiling windows that embrace spectacular views of the surrounding Baa atoll and Maldivian sunsets and a retractable roof, enabling guests to dine beneath the twinkling night sky. So Hands On is an over-water sushi counter helmed by Michelin-starred Chef Kenji Gyoten with a hinoki countertop made from Japanese pine polished by sake. Open for lunch and dinner; the restaurant serves some of the best sushi outside of Japan. 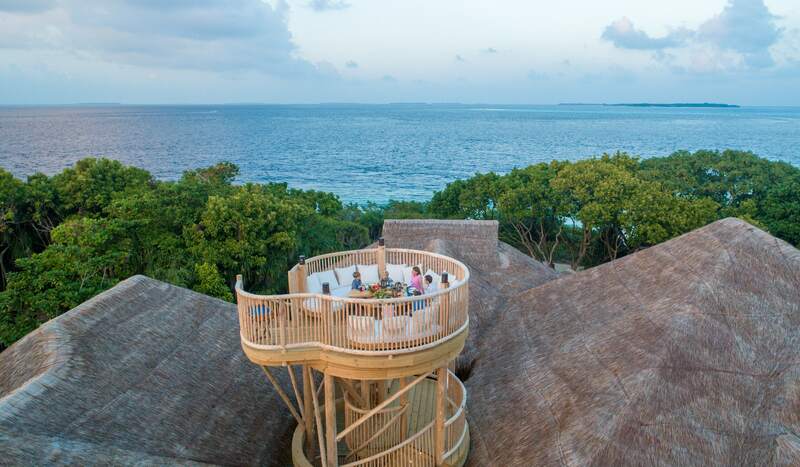 So Bespoke is an open-air Teppanyaki table headed by Chef Gede Sujana that serves highly acclaimed Japanese for dinner on Monday, Wednesday, Thursday, Friday and Sunday against a backdrop of panoramic views of the Baa Atoll and beyond. Ravi’s offers a selection of international and South Asian cuisine with a focus on fresh seafood for dinner every evening, and hosts buffet banquets on Tuesday and Saturday evenings. Shade of Green offers the ultimate farm-to-table experience where diners get to harvest the ingredients for their plant-based dinners. Before dining, guests take a guided tour of the beautifully maintained garden, learning about the herbs, fruits, and vegetables while picking fresh ingredients for dinner. Guests then gather around a fire pit for an appetizer, then move to romantically placed tables set beneath fruit trees to enjoy the remaining six courses. Shades of Green offers a seasonally-changing five-course menu that is centered around the colors red, green and yellow. Chef Kyster expertly blends Maldivian and other Southeast Asian cuisines with the latest Nordic culinary techniques, such as salting, smoking, pickling and fermenting to produce unique dishes that are designed to fulfill six categories: cleanse, raw, crispy, grain, fire and sweet. Signature dishes include mangosteen kombucha paired with plums, beetroot vinegar powder, and shiso leaves is a cleansing dish. Shades of Green is open for dinner Sunday, Monday, Wednesday, Thursday and Friday. Set around a tranquil pond and tinkling waterfall and surrounded by lush jungle, the indulgent Six Senses Spa offers a menu of holistic and traditional treatments, along with Thai, Balinese, and doctor-assisted Ayurvedic treatments and nutritional program that soothe the body, soul, and mind. 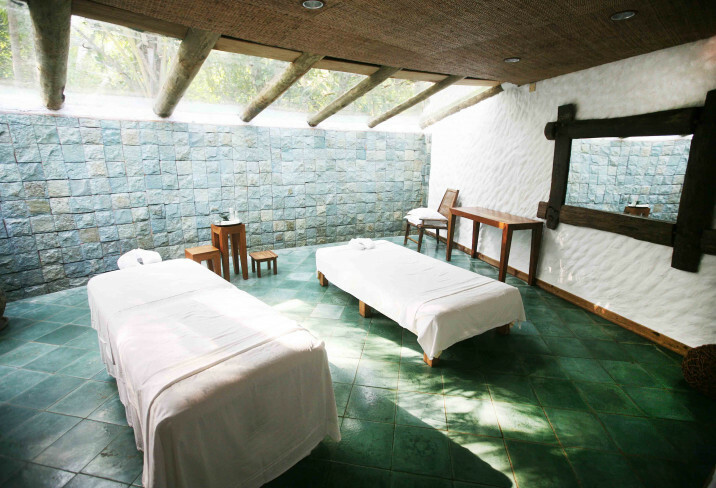 The Spa also has a fully equipped gym, a yoga pavilion for wellness therapies such as yoga and Tai Chi, and private beachside treatment villas. Soneva Fushi offers a wealth of both land and water-based experiences, as well as cultural excursions, romantic dinners for two and one-of-a-kind island treats from guided snorkeling and scuba diving trips, sunset dolphin cruises, astronomical dinner cruises, and Robinson Crusoe castaway picnics to gourmet gastronomy and oenology experiences, private sandbank experiences, cinema and stargazing experiences, glassblowing classes, and snorkeling with manta rays. 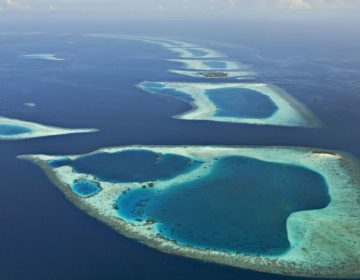 Guests can also learn to free dive, scuba dive and surf on less charted and secret surf breaks in the Baa Atoll and visit the capital island of the Baa Atoll, Eydhafushi Island, and the quaint traditional fishing island of Maalhos Island. 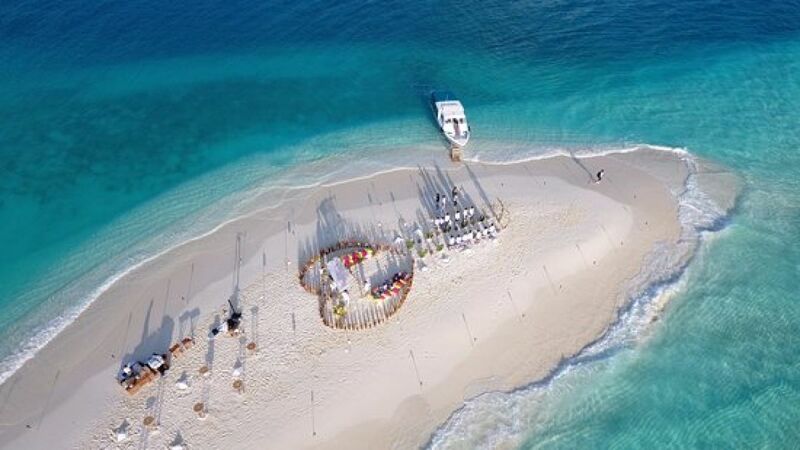 Soneva Fushi provides an exquisite canvas on which to create a one-of-a-kind wedding or honeymoon. 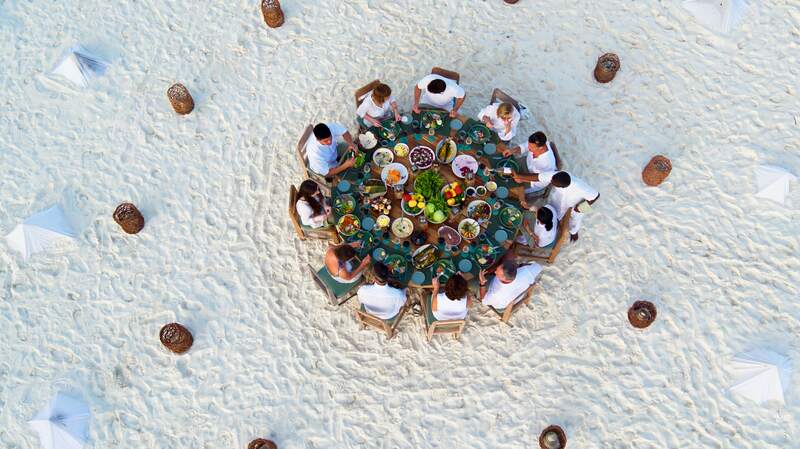 From ceremony to cuisine, Soneva Fushi’s wedding coordinators will take care of the smallest details, while specially tailored wedding packages promise luxurious stays and unforgettable experiences. 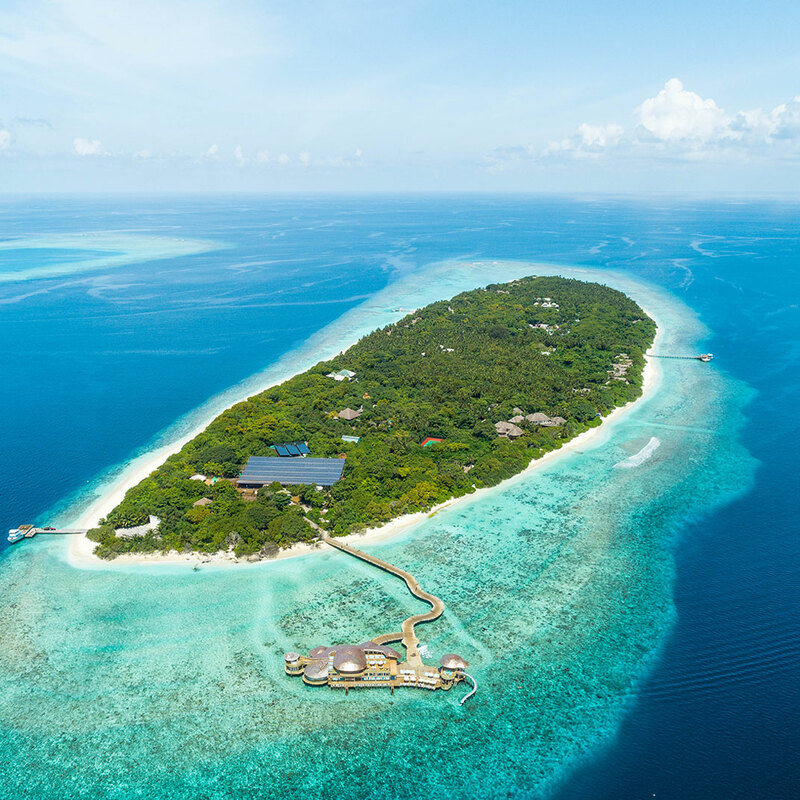 For those who prefer to celebrate in complete privacy, the entire island and resort buy-outs are also available, providing the ultimate Soneva Fushi experience. 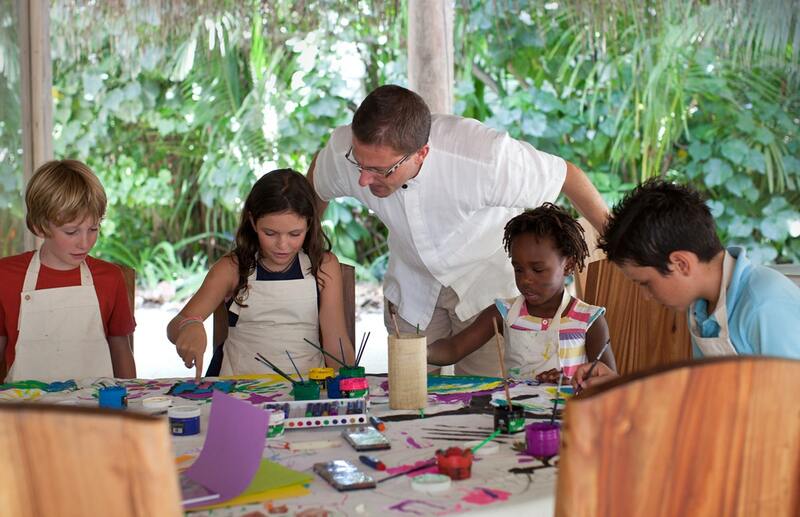 Soneva Fushi offers a variety of experiences for families with children. The Den provides a fun-based space for children to run riot with a pirate ship, two swimming pools, a Lego room, a dress-up area, a cinema, a library, a learning area, and a music room with instruments.